As a young man, Mr. Ortenzio learned that a good education can open doors that otherwise would be closed. He is well aware of the tremendous difference that education made in his own life's direction. One of his earliest philanthropic gestures was providing financial assistance so that local children could attend parochial secondary education. Over the years, Mr. Ortenzio became a generous supporter of public, private and parochial schooling and funds scholarships through his own private foundation. In 2010, The Rocco and Nancy Ortenzio Foundation provided the single largest grant to Bishop McDevitt's Fulfilling the Promise capital campaign. Construction is currently underway on a new $42-million Bishop McDevitt campus in Lower Paxton Township, Pennsylvania that will feature a 175,000-square-foot academic facility, 1,200-seat auditorium, 120-seat chapel, 1,000-seat gym, a state-of-the-art library, performing arts center and athletic facilities. In December 2009, Mr. Ortenzio's Foundation pledged support for the further development of the Stayer Center for Executive Education at the University of Notre Dame. 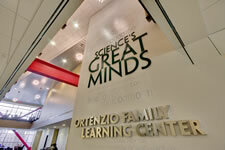 Closer to home, the generosity of Select Medical and two Ortenzio family foundations resulted in The Ortenzio Learning Center and the Select Medical Conference Center at Harrisburg University of Science and Technology. This combined gift represented the leading private gift received by Harrisburg University. In 2009, the Ortenzio Family Endowment Fund for Entrepreneurship was established at Susquehanna University to support entrepreneurship activities in the University's Sigmund Weis School of Business. Mr. Ortenzio also focuses his philanthropic efforts related to health care and education. The Select Medical Health Education Pavilion at Harrisburg Area Community College is another enduring symbol of Mr. Ortenzio and Select Medical's support of local higher education institutions. Most recently, in 2011, the Rocco Ortenzio Chair of Physical Medical and Rehabilitation was endowed at Penn State Milton S. Hershey Medical Center and Penn State College of Medicine. This endowed position will further address the growing need throughout Pennsylvania for physical medicine and rehabilitation care, education and research. In addition to furthering the future of this medical specialization locally and nationally, the Chair represents a culmination of Mr. Ortenzio's 55-year career in medical rehabilitation, as a clinician and business executive.